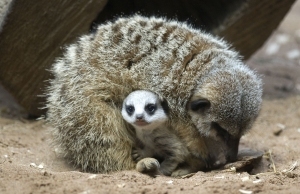 ST Andrews Aquarium is today mourning the sad loss of Piper, the first meerkat born to Kate and Wills at the aquarium. In recent weeks, Piper had demonstrated signs that he was suffering from malformation of the joints in his front legs. Acting on veterinary advice that Piper was likely to be experiencing considerable pain – which was expected to worsen rather than improve – Aquarium bosses made the difficult decision to say goodbye to this much-loved member of the Aquarium family. Piper, who was born on 2nd March, had become quite a celebrity in his short life. Commanding many column inches, as well as YouTube notoriety, for his noble position as Kate and Wills’ first born.